Pretty simple here. Make sure people enjoy each other's company. I try to invite people with varied backgrounds. 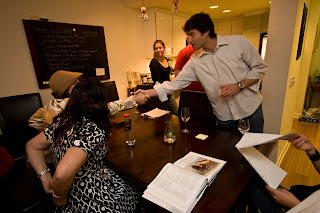 I like to involve the guests in as many aspects of the dinner party as I can. Some friends are great at getting conversation started. Some like to see how things are run. Some like to watch a specific technique. There are even some dishes that I'll coach a guest through. Here the guests are getting to know each other, while another is reviewing my planning, budgeting, notes, and execution plan for the food.